Ojas Gujarat Police bharthi Notification Apply Online 2018: Gujarat Police Department has released the notification for 6189 Police Constable/Sipayi posts. Candidates aspiring to become police constable in the state of Gujarat can utilize this opportunity and apply for the announced posts within the announced dates. 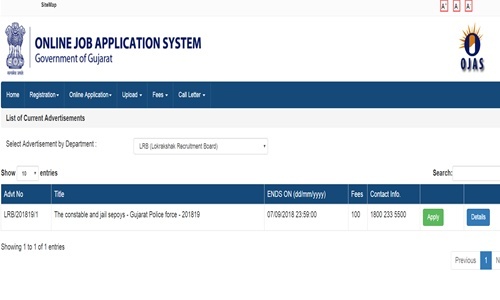 The online application for Gujarat Police Constable posts was started on 15th August and the last date to apply for the announced posts is 7th September. Applicants can visit the Gujarat Police Department official portal, ojas.gujarat.gov.in to apply for the Gujarat Constable posts. Aspirants can go through the following article to know more details about Gujarat Police Constable eligibility criteria, application process, important dates, selection process, and other details. Gujarat Police Department is the safety and security protector of Gujarat state. The organization annually issues various recruitment notifications to hire the suitable aspirants into various designations. The Gujarat Police Department has recently announced a notification for a large number of posts. The department announced 6189 Armed/UnArmed Constable, Sipayi & other Posts. The application process for the announced posts has scheduled from 15th August to 7th September. Aspirants waiting for Gujarat Police Constable Notification can apply for Constable/Sipayi posts during the application dates. The selection of aspirants will be done through various rounds such as written test, physical measurements test, physical eligibility test, and interview rounds. Applicants can check the Gujarat Police Constable eligibility criteria, application process, selection process details from the following. Candidates must have passed class 12th/Intermediate in any stream from the recognized board/university. Note: Applicants must also have the physical fitness and measurements as mentioned in the notification. Also, candidates must have the clear vision, as per the notification says. Applicants must be in between 18 to 33 years. Age relaxation for reserved category people will be allowed as per the notification. Shortlisted aspirants will get a good pay scale along with the grade pay as per Gujarat Police Department norms. Selected candidates will get a sum of Rs. 5,200/- to 20,200/- + 1900 GP per month. How to apply for Gujarat Constable Posts 2018? Interested and eligible aspirants can proceed to apply through online @ ojas.gujarat.ac.in. Candidates can apply from 15th August to 7th September. The Online application form will be accessible on Gujarat Police Department Official portal during the application dates. Just by filling up the online application, paying the requisite application fee, and attaching the required documents candidates can apply for Gujarat Police Constable Posts 2018.